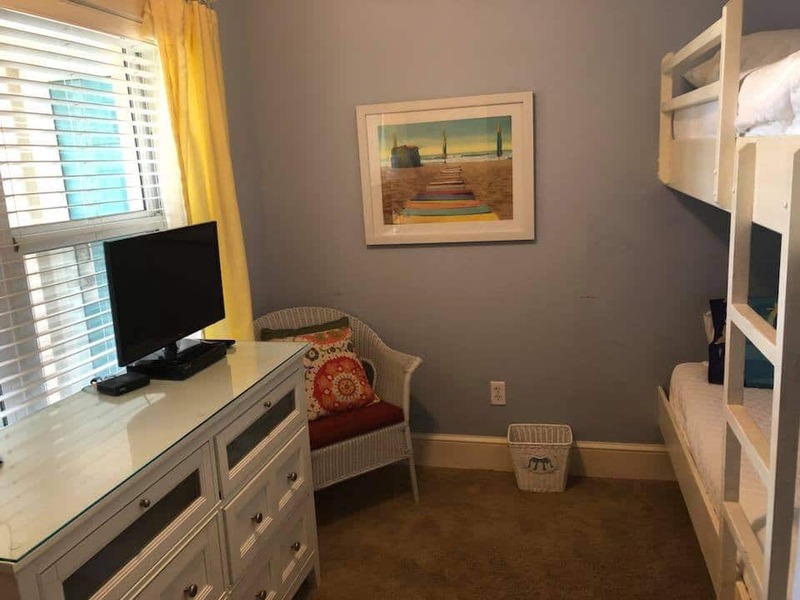 Disclosure: ResortQuest by Wyndham Vacation Rentals hosted my family. All opinions and text are my own. If you are a mom, actually if you are a grownup, you understand what I mean when I say “the next thing.” From the moment I get up until I finally go to sleep at night my day moves from one thing to “the next thing.” I barely get one task finished before I am already thinking about the next thing I have to do. Don’t get me wrong, I love my life, but being a wife, mom to 4, homeschool teacher, and business owner can be a lot. The sheer responsibility of running our home, taking care of the kids, housework, laundry, etc. keep me hopping from daylight until dark. I don’t spend a lot of time being still, and I didn’t even realize I wasn’t savoring moments as much as I should until we went on vacation a couple of weeks ago and time slowed down. This is one of the main reasons why we made changes a couple of years ago to spend less money on stuff and invest in vacations, quick get-aways, and staycations together instead. As our kids grow up, they aren’t going to remember everything we bought them, but they will remember that we were purposeful to spend time with them. With four kids of varying ages (14, 11, 3, and 1) we want them to be close to each other and to make memories together, especially since our older ones will be grown before we know it. In our day to day life, it is hard to slow down. So, vacations are a big part of our life. 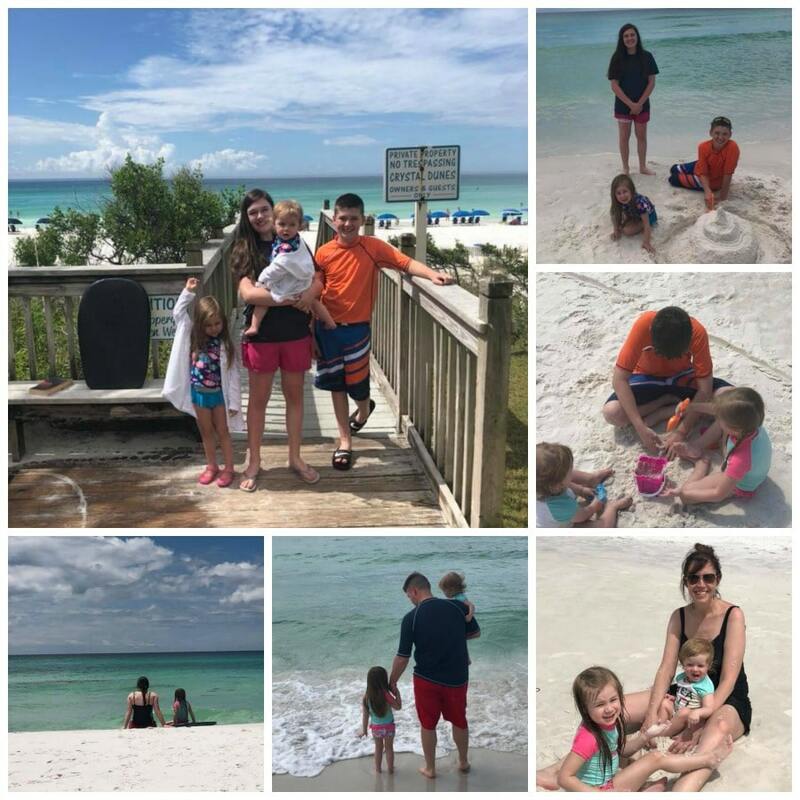 A couple of weeks ago, we headed to Destin, Florida, one of our favorite vacation spots, for some much-needed relaxation. Destin is located in northwest Florida in the Panhandle on the gulf coast. It is known for its family-friendly environment, white sand, and gorgeous beaches. 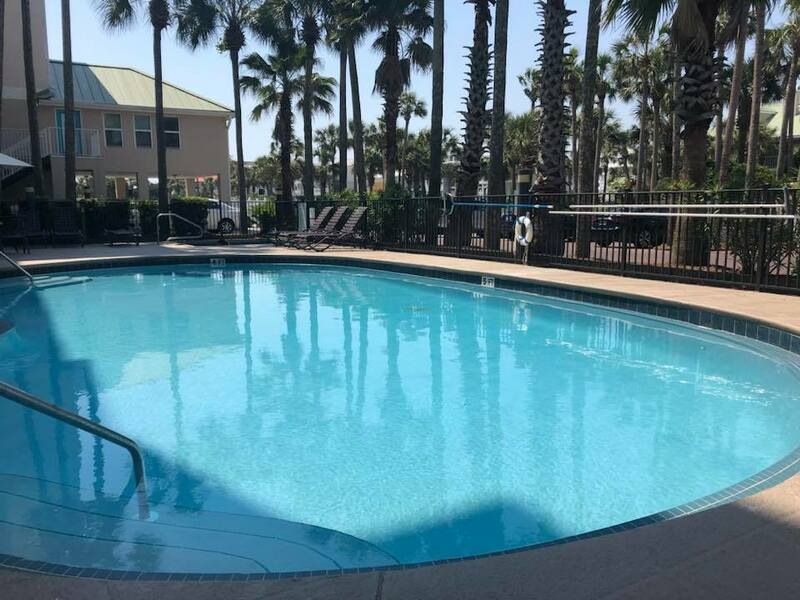 We reserved our condo through ResortQuest by Wyndham Vacation Rentals. As soon as we got to Destin, Fl and unloaded the car, we headed out to dinner and grocery shopping, which made for a long busy day. 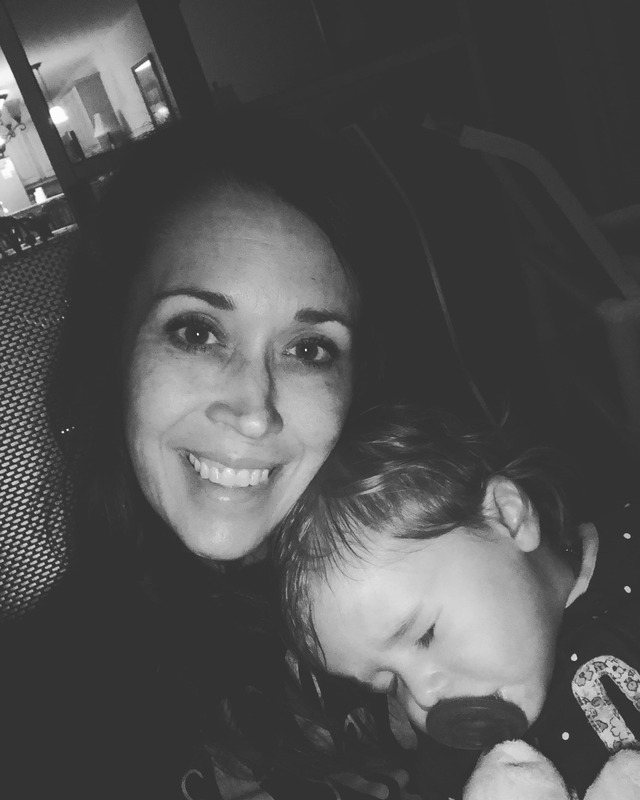 Once it was time to put the little girls to bed, I took my youngest out on the balcony to rock her to sleep. As I listened to the ocean waves crash against the shore and gazed at the clear dark sky, I began to relax and could sense all the busyness of the past couple of months leaving my mind. As she nestled her head into my neck and drifted off to sleep, I didn’t have anything to do next and so instead of my mind racing to the next thing I was still. I watched her little curls slightly move with each breath. I felt her body relax and the warmth of her little tummy against mine. 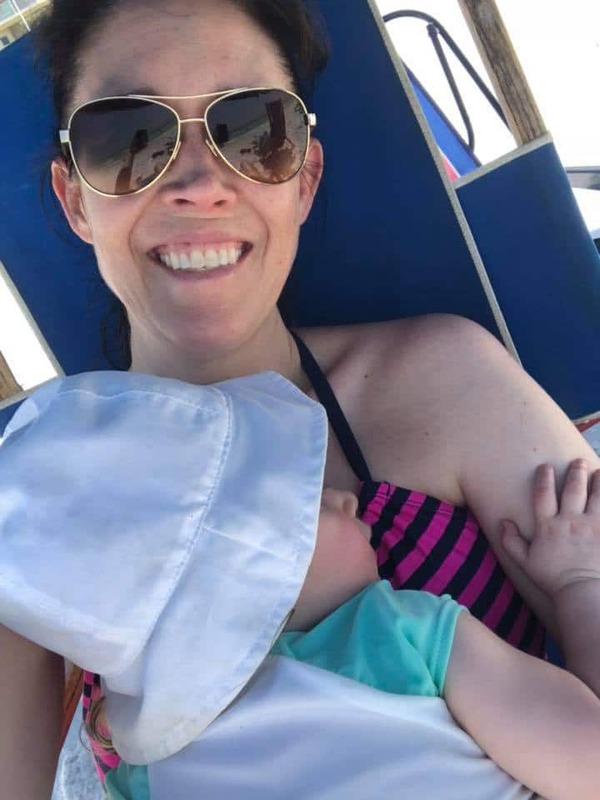 I held my sweet baby girl and vowed to slow down and savor every moment of our vacation. As the day blurred into the next, we didn’t hurry or make a lot of plans. Each day was pretty much the same as the day before. We started our days cooking breakfast in our condo together. The kitchen was fully equipped, so all we needed were groceries. After breakfast, we headed down to the beach. The beaches along the Gulf Coast are breathtaking. They are so gorgeous and clear with pristine white sand. The condo that we reserved through ResortQuest was on a private beach. 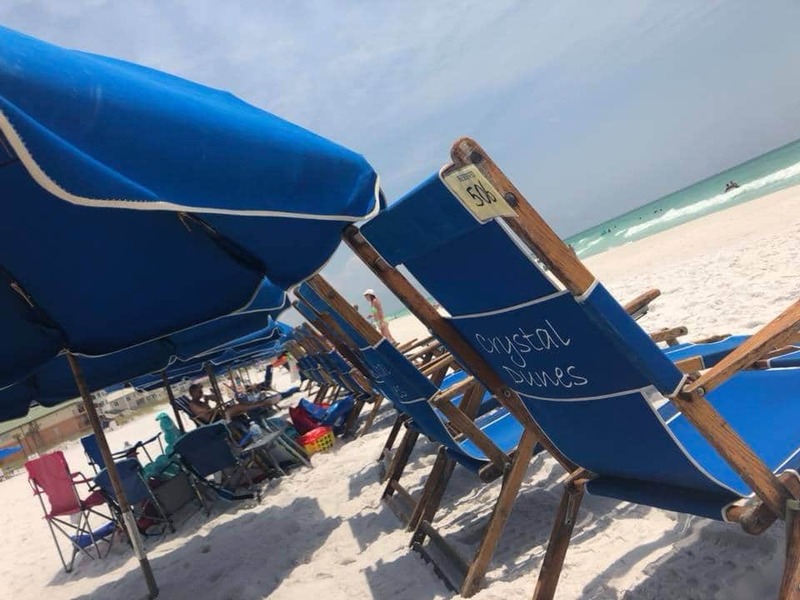 They also provided two beach chairs and a big umbrella that were set out each morning through their free beach service. “The beach guys,” as we called them, would check in with us and help us find an available umbrella and chairs. They would even let us know when they were leaving for lunch. It was such an bonus. I can’t imagine making a trip to the beach without this type of beach service now that we have had an opportunity to enjoy it. Next, we’d enjoy the pool. The pool was closed a couple of days for maintenance. Although we missed swimming those days, we were happy to see that the resort took such good care of the pool and was intentional about making updates for the season. Then, we would go to our condo, and I would make lunch while my hubby would bathe the little ones. Since our condo was equipped with everything we needed, we saved quite a bit of money not going out to eat every day for lunch and breakfast. For a family of 6, the savings added up and were significant. The afternoons were spent resting while the babies napped. It was exactly what we needed and such a wonderful time to reset our minds. The hubs and I were able to get a little work done, and the big kids read books, but we mainly hung out together while the baby girls were napping. After naps and resting it was time for dinner. 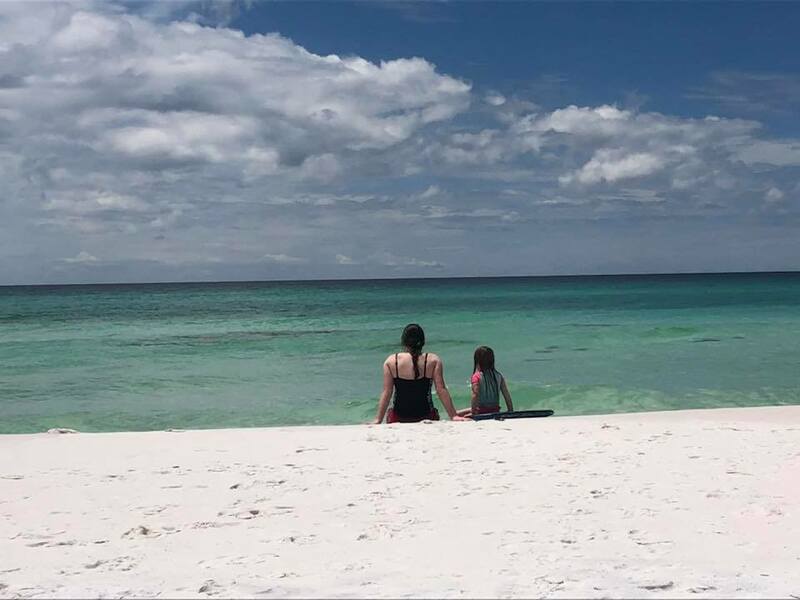 Since Destin is our favorite summer vacation spot we have a couple of favorite restaurants we always enjoy, then we picked out two or three new ones to try. 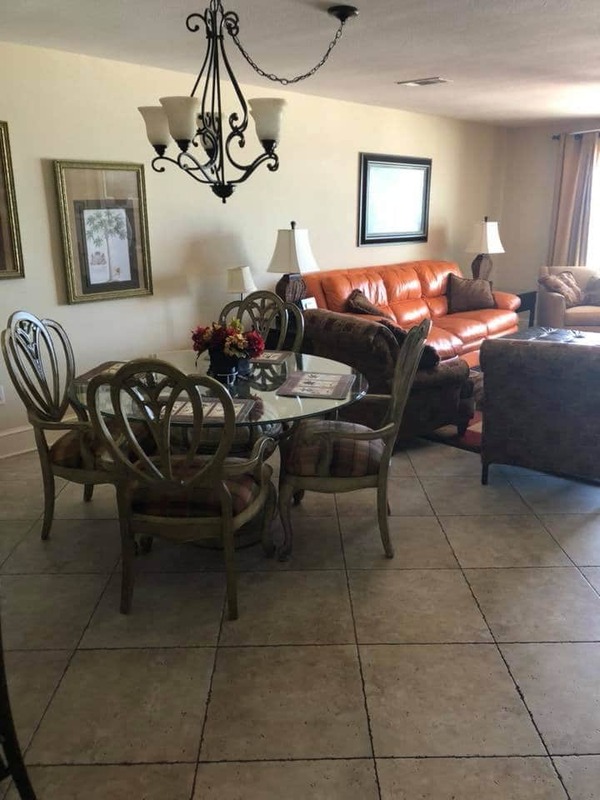 Our condo was located right in the middle of Destin making it just a short drive to shopping, dining, and entertainment. 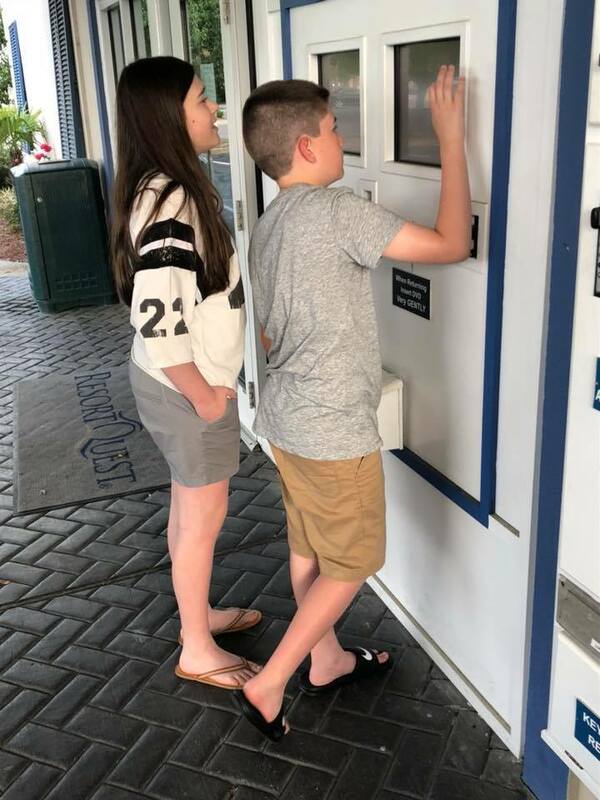 After dinner, we either shopped at the huge outlet mall, headed back to the condo to watch a movie, or enjoyed go-carts and carnival type rides at The Track. It was such an incredible week; I wish I could have slowed down time so that it didn’t go by so quickly. 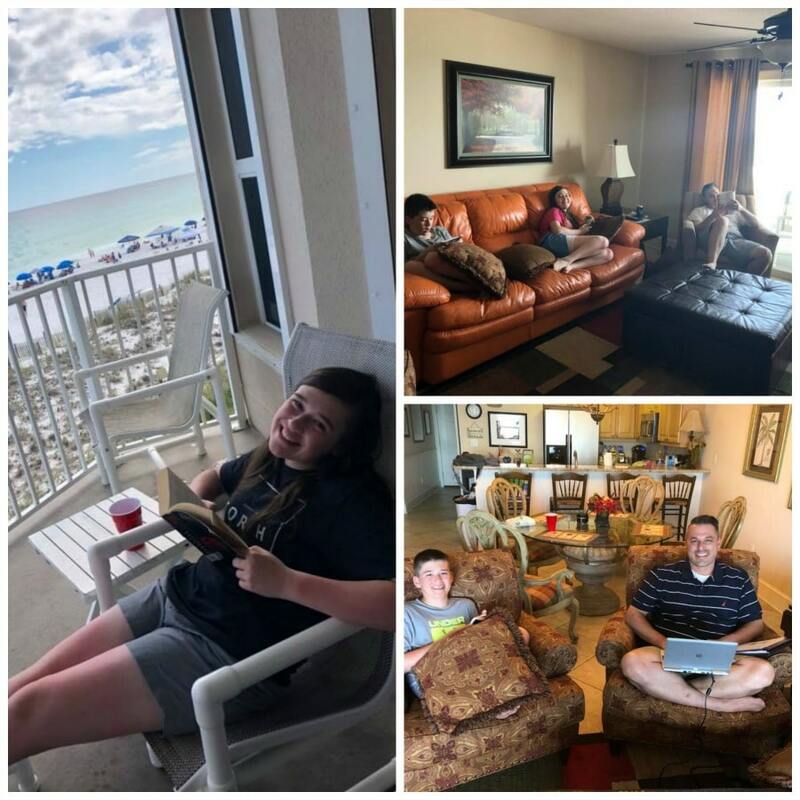 Now that I have shared our amazing vacation, I thought I’d take you on a tour of our condo at Crystal Dunes through Resort Quest NWFL. It’s always nice to see a personal recommendation before planning a vacation. 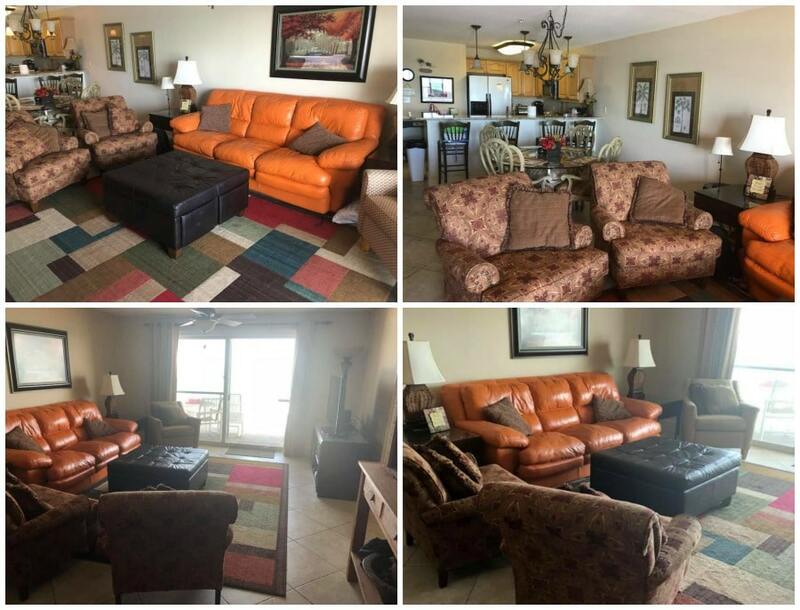 We stayed in a 3BR, 2 BA condo that was gulf-front. When you walked in, the first bedroom was directly to your left. It had these cute built in bunk beds that were perfect for two of our girls. It also had a tv and DVD player. Across the hall was another bedroom with a king size bed, tv, and DVD player. Beside this bedroom is a nice bathroom with a door to the bedroom and another door to the hallway so that it has easy access. I might be the only one excited about this washer and dryer, but I have a hunch other mommas might not want to return home from vacation with mounds of dirty, stinky clothes. For me, a washer and dryer are a necessity. 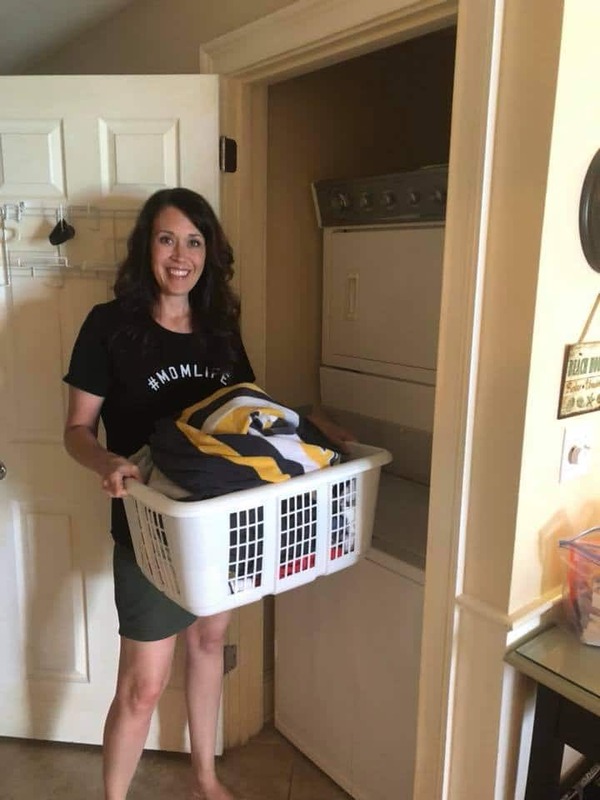 I washed a load or two a day, and the only dirty clothes we brought home were the ones on our backs, which meant less stress for me to catch up the week after vacation. Additionally, I appreciated the fact that the unit was equipped with a vacuum, broom, dustpan, and mop. When you are tracking sand everywhere, and you have lots of kids eating meals around the table, a vacuum and broom are much needed. I’m not a clean freak, but I cannot deal with crumbs and sand all over the place. 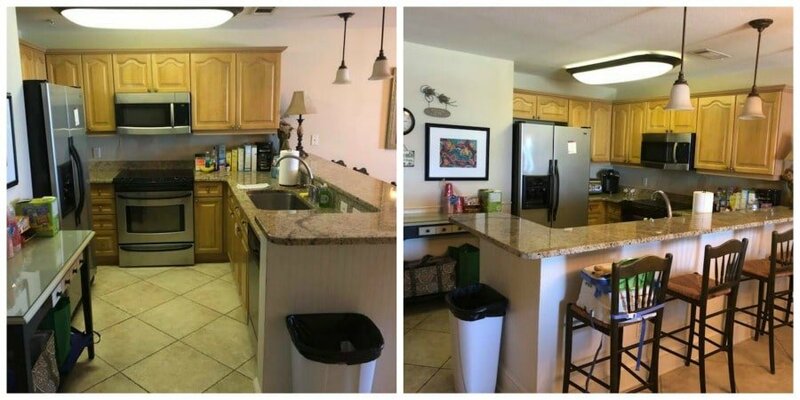 The kitchen was nicely equipped with granite countertops and stainless appliances. There was also a blender, toaster, Keurig coffee maker and a regular coffee maker. We made breakfast and lunch almost every day as the kitchen was stocked with pots, skillets, baking pans, flatware, knives, kitchen utensils, and Rubbermaid containers just to name a few. I loved the open floor plan. Even when I was in the kitchen cooking I still very much felt a part of my family hanging out in the family room. On the other side of the kitchen was a nice large round breakfast table. Between the breakfast table and bar stools, we had plenty of room for everyone. There was also an extra chair that we pulled up to the table. 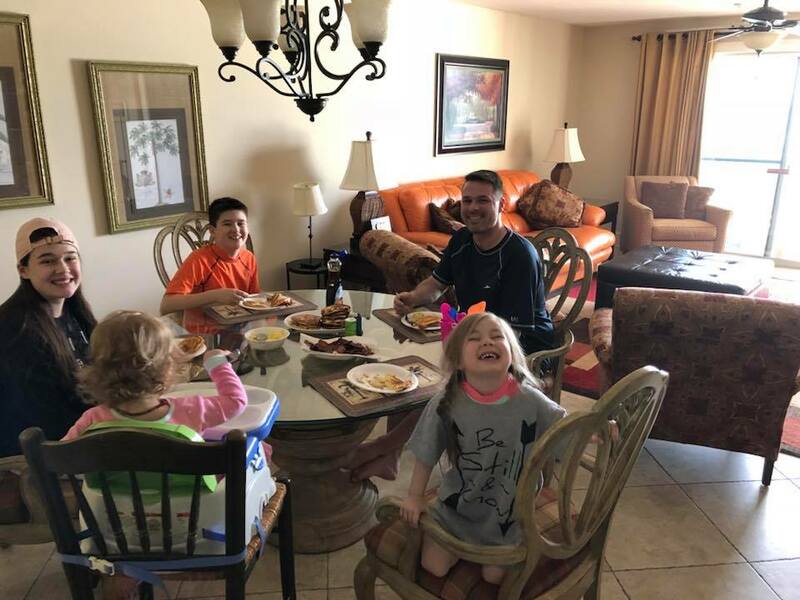 My oldest daughter said that some of her favorite vacation memories over the years had been the time we spent making breakfast together and our leisurely meals around the table. It is in these normal, ordinary moments that lifelong memories are made. Even though we always eat together at home, she loved the slow pace of vacation and not having to rush anywhere. The family room was just the right size for our family with lots of seating, a tv, and DVD player. I loved that we could pull the curtains back and leave the screen door open and enjoy the gorgeous view and sound of the ocean. Although we didn’t need it, the couch pulled out into a bed, and all linens were provided. There were also extra pillows and blankets in all of the bedroom closets. I couldn’t for the life of me get a picture of the master bedroom empty. 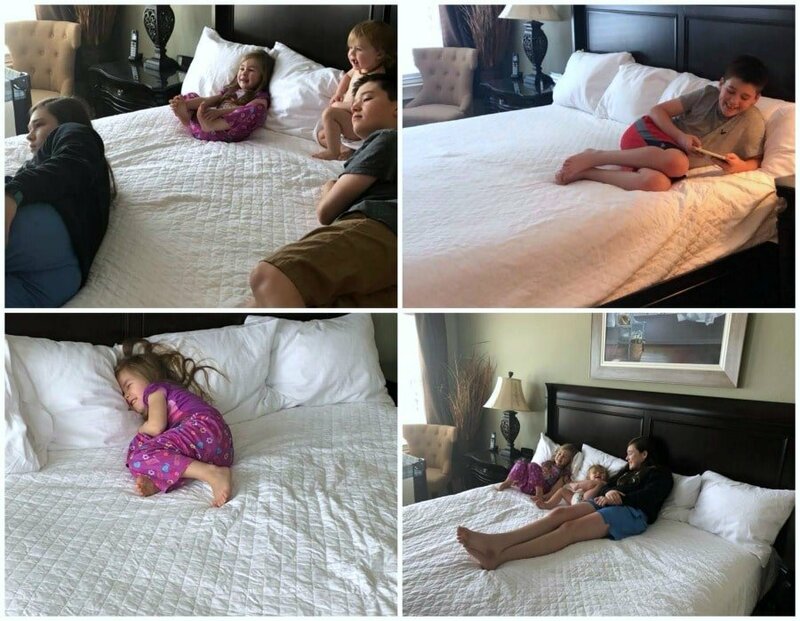 At any given time one or all four of the kids were piled up on our bed hanging out together or watching a movie. 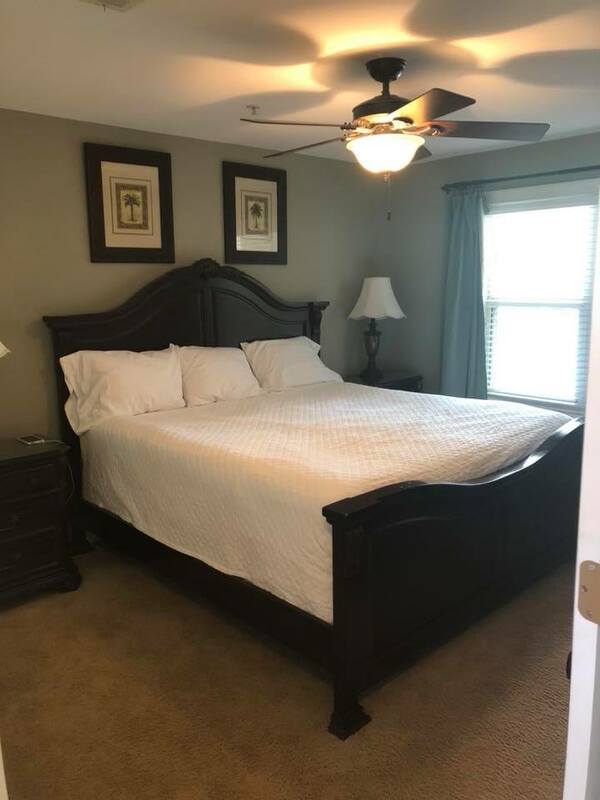 I treasure the fact that our kids love to hang out together and with us, so I thought this picture was a better example of the master bedroom. The king size bed was, of course, fabulous and extra comfy. The bedroom also included a nice tv, DVD player, and a gorgeous view of the beach, but what I loved the most were all these people who followed me in here every single day. 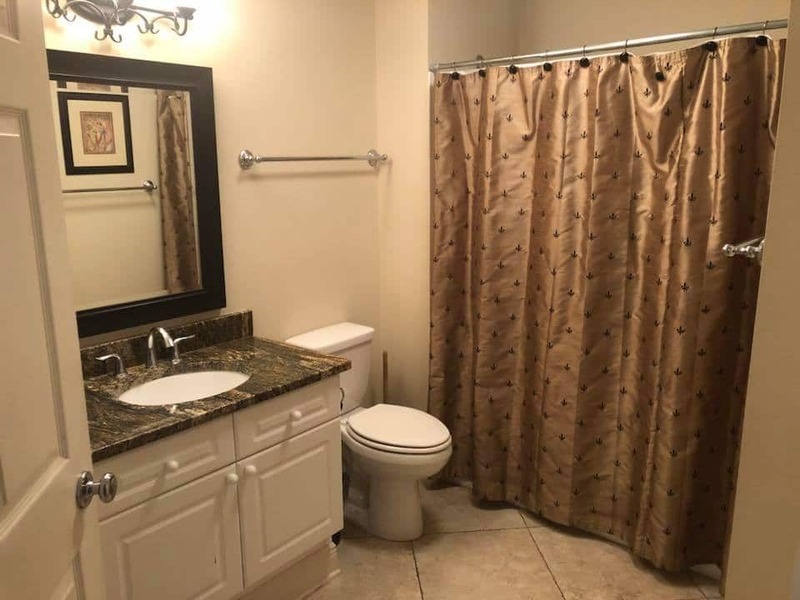 The master bathroom was huge with a double vanity, soak in tub, and glass enclosed shower. The little girls loved to take a bath in the huge tub after time at the beach and pool. They thought it was extra special. The balcony was my happy place. We had such a gorgeous gulf-front view of the beach and yet it was very private on each side. 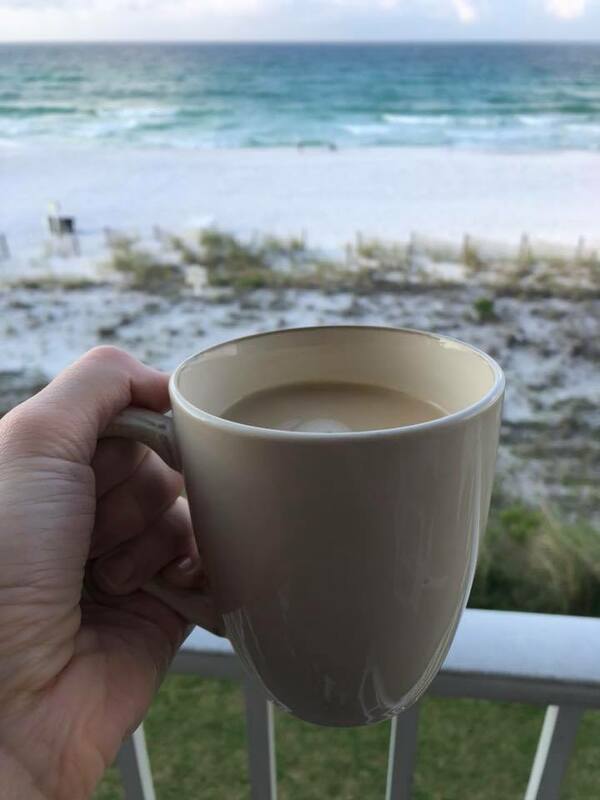 I started off each day with a cup of coffee on the balcony while I soaked up the quietness of the morning before all my people woke up. It was so relaxing and the perfect way to gather my thoughts before starting our day. Then, I ended each day by rocking my sweet baby on the balcony while we listened to the ocean. It was my most favorite part of our condo. As I had mentioned previously, the beach chairs and umbrella were provided free through their beach service. They were nice and sturdy, and there was plenty of room under the umbrella for the little girls to get out of the sun with us. Could this beach get any more gorgeous with the crystal clear water and white sand? The kids loved going from the beach to the pool, which is seasonally heated. There was also a hot tub. Most of the time we had the pool to ourselves, which was nice. Another great amenity that was a first for us was unlimited movie rentals. We were given a special card at check-in, and anytime we wanted to rent a new movie we could pick up two at a time for absolutely free. Also, KeyToTheBeach.com offered discounts from local vendors exclusively for ResortQuest guests. As you can see, we truly treasure making memories as a family. The fact that we only get 18 years with each kid before adulthood weighs heavy on my heart, and I don’t want to miss moments or opportunities to make deposits into their life. 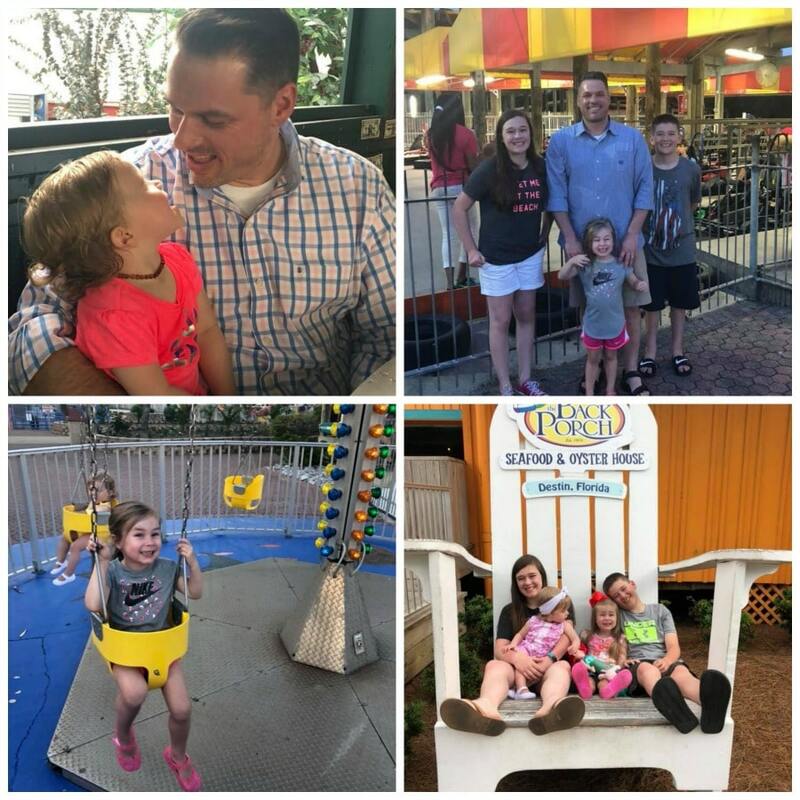 Additionally, as busy parents, being able to spend time with my husband without having to worry about “the next thing” we had to do was exactly what we needed. We are intentional to schedule vacations by making sacrifices all year long and saving weekly so that it fits our budget. 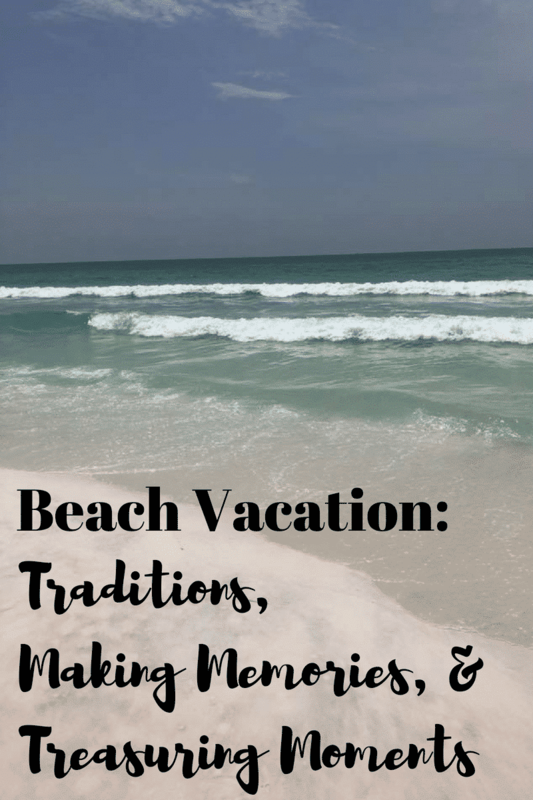 We are so thankful for our vacation traditions, making memories together, and treasuring moments. To plan your next vacation, checkout ResortQuest by Wyndham Vacation Rentals. ResortQuest is part of a selection of professionally-managed beach homes, condominiums, and resorts. You can follow ResortQuest on Twitter, Facebook, and Instagram. Right now you can save 15% off on summer travel with Promo Code: Beaches / 855-318-8729. You can book by calling or taking advantage of their easy to search website.